'Circus,' by Michael Thomas. Welded, painted steel. 2016. One of the sculptures in the Flying Horse Outdoor Sculpture Exhibit. South Hamilton — The work of several artists from the Berkshires is included in the ninth annual Flying Horse Outdoor Sculpture Exhibit in South Hamilton, Mass., a North Shore town 25 miles outside of Boston near the seaside towns of Gloucester and Rockport. 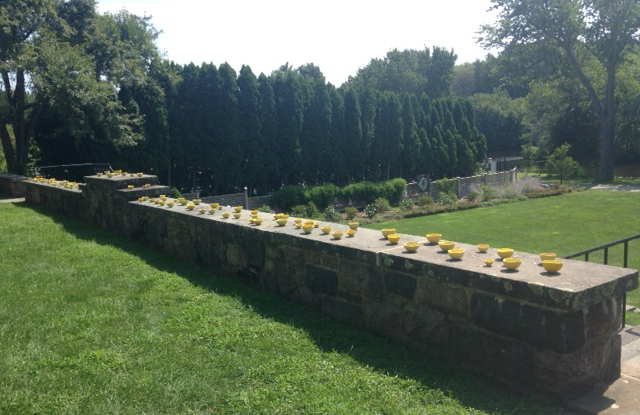 Peter Barrett, William Brayton, Erika Crofut, Martina Muller, Michael Thomas, Robin Tost, and Setsuko Winchester were invited to participate with 40 other sculptors from New England, New York and as far away as California and Mexico. A total of 55 pieces are displayed on the 100-acre campus of Pingree School, an independent coeducational school for grades 9-12. 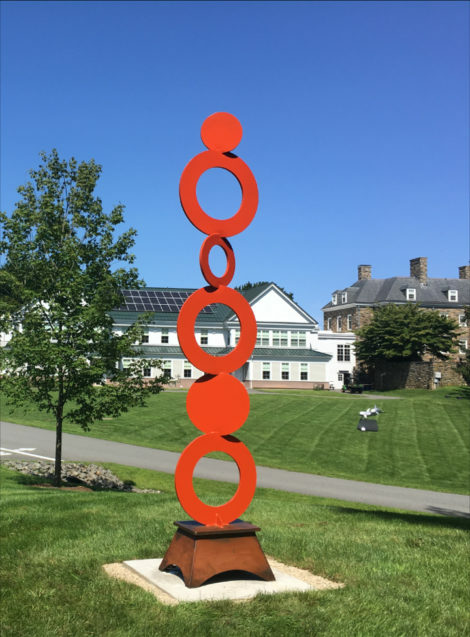 Pingree is the only school in the country to host such an art show, and the exhibit has become the largest outdoor sculpture show in the Northeast. The curator of the exhibit is Judith Klein, sister of Great Barrington resident and writer Daniel Klein. Klein originated the show when she became director of marketing and communications at Pingree School in 2010. She continues to curate and organize the exhibit each year as a consultant for the school. This year’s Flying Horse Outdoor Sculpture Exhibit opened on September 1 and closes on November 4. Admission is free and open to the public seven days a week during daylight hours; there is a full-color catalog and printed map available in a “mailbox” on campus; a free guide can also be downloaded to Smartphones (in the Apple App store under Pingree Sculpture Show). The public is invited to a reception with the artists on Sunday, September 16 at 1 p.m. when Honorary Chair George Fifield, director of Boston Cyberarts, will speak about digital technology’s impact on public art. For more information, call 978-468-4415 or write jklein@jkconsult.net .